U.S. 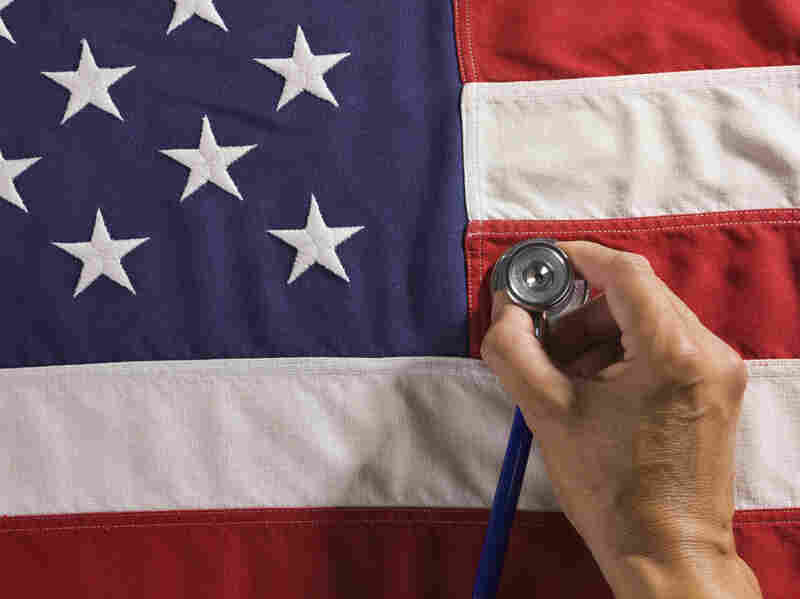 Ranks Below 16 Other Rich Countries In Health Report : Shots - Health News Americans are sicker and die sooner than their counterparts in comparable nations. No single cause can account for the difference, but improving medical care will only help so much, as disparities can be traced to dietary choices, drugs and alcohol, guns, and even cars. It's no news that the U.S. has lower life expectancy and higher infant mortality than most high-income countries. But a magisterial new report says Americans are actually less healthy across their entire life spans than citizens of 16 other wealthy nations. And the gap is steadily widening. "What struck us — and it was quite sobering — was the recurring trend in which the U.S. seems to be slipping behind other high-income countries," the lead author of the report, Dr. Steven Woolf, tells Shots. Strikingly, even Americans who are white, insured, college-educated and upper-income are worse off than their counterparts around the world — a finding that no one quite understands. "People with seemingly everything going for them still live shorter lives and have higher disease rates than people in other countries," Woolf says. The 378-page report was completed under the auspices of the National Research Council, an arm of the National Academy of Sciences. It grew out of an effort last year that concluded the U.S. has a large and widening "mortality gap" among adults over 50 compared with other high-income nations. The new report focuses on the other part of the population, Americans under 50. Two-thirds of the difference in male life expectancy between the U.S. and other countries is due to deaths in that under-50 age category, and one-third of the gap is due to deaths among women under 50. The report also finds that the U.S. fares worse in nine health domains: birth outcomes, injuries and homicides, teen pregnancies and sexually transmitted infections, HIV/AIDS, drug-related mortality, obesity and diabetes, heart disease, chronic lung disease, and disability. Areas in which the U.S. is not behind other wealthy countries are cancer screening and mortality, control of high blood pressure and cholesterol, smoking rates, and suicides. The panel concludes that part of the nation's poor ranking can be attributed to problems with its $2.6 trillion-a-year health care system (the world's most expensive by far). Those problems include the 50 million Americans without health insurance, fewer doctors per capita, less access to primary care and fragmented management of complex chronic diseases. But the new report places more stress on nonmedical shortcomings. Many people might be surprised to learn, for instance, that for more than half the males who die before age 50, the cause of death has nothing to do with disease — and is therefore not amenable to reduction through medical care. Those causes include murder (19 percent of deaths in males under 50), traffic accidents (18 percent), other accidents (16 percent) and suicide (4 percent). Only 35 percent are disease-related, and 7 percent are other causes. Among U.S. women under 50, the picture is different — 53 percent of deaths are disease-related, 38 percent are due to accidents, homicides and suicide, and 9 percent are listed as "other." Guns have a lot to do with the homicide and accidental deaths. The report notes that murder rates involving guns are 20 times higher in the U.S. than in 22 other rich countries. "Clearly we need to do something about violence and firearm-related homicides if we're going to close the gap," Woolf says. "It's a major contributor to the loss of years of life in our country among young people." Much of the poor health outcomes and premature mortality is due to other nonmedical causes — such as behavioral choices like drug and alcohol abuse, a built environment that favors auto travel at the expense of exercise, and dietary habits. Americans consume nearly 4,000 calories a day on average — more than anyone else in the world. "That wasn't always the case," Woolf says. "But over the past 20 years, the consumption of high-calorie foods and refined sugars and other dietary causes of obesity has increased dramatically in the United States in comparison to these other countries." Many reports of this ilk serve as doorstops or dust-catchers, but Dr. David Kindig, a population health specialist at the University of Wisconsin, Madison, says this one shouldn't be ignored. "It's not like we haven't known some of this yet, but it hasn't penetrated — how serious it is," Kindig says. "I hope that [the report] would be a wake-up call, almost like Sputnik. You know, let's get going on this over the next decade." Kindig says some clues about what to do come from a state-by-state analysis of U.S. health disparities that he and his colleagues do every year. "Some of the healthiest states — say, like Minnesota — actually spend less on health care," Kindig says. "And presumably that allows them to spend more on some of the other determinants of health." Education is one of those determinants. Kindig says it would be a mistake to cut spending on schools since education and health are tightly linked — and cuts there will just show up later in poorer health. Woolf, the panel chairman, says the nation's problems may be deeply rooted in Americans' love of personal choice and aversion to government regulation of health and safety. That won't be easy to change. "It is a difficult one to tackle," Woolf acknowledges. "But we need to have a national discussion about whether we do or don't. We're living shorter lives and we're living sicker because of something we're doing in this country." Woolf says Americans need to decide if they're OK with that — or are prepared to make different choices.